We started out by reading the book “The Grouchy Ladybug” by Eric Carle. 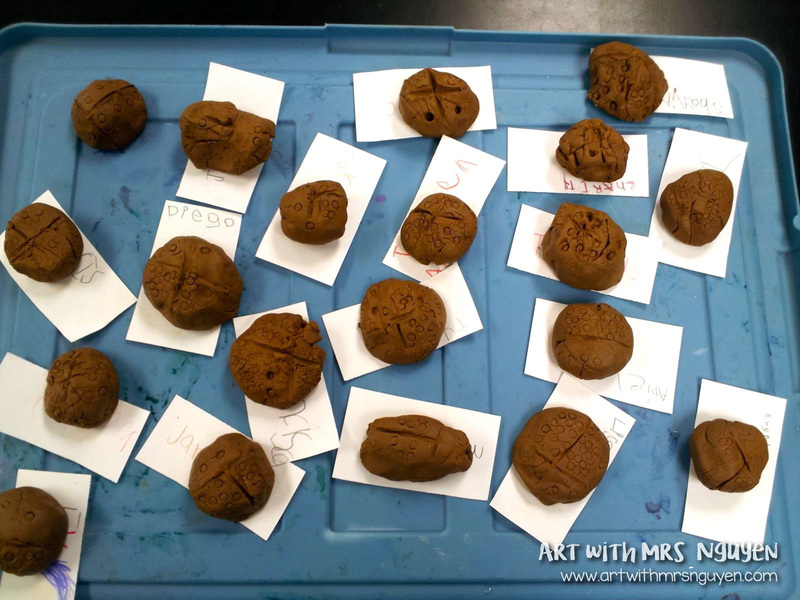 After reading the book, I introduced my kinders to my clay rules and procedures, and then gave each student a piece of clay and a canvas mat to work on top of. To begin, students rolled their clay into a ball, then using their thumb, made a thumb-print in the middle of their clay. Then I had them hold up their ‘pincher-fingers’ and pinch, pinch, pinch to create a slightly flattened pinch-pot. 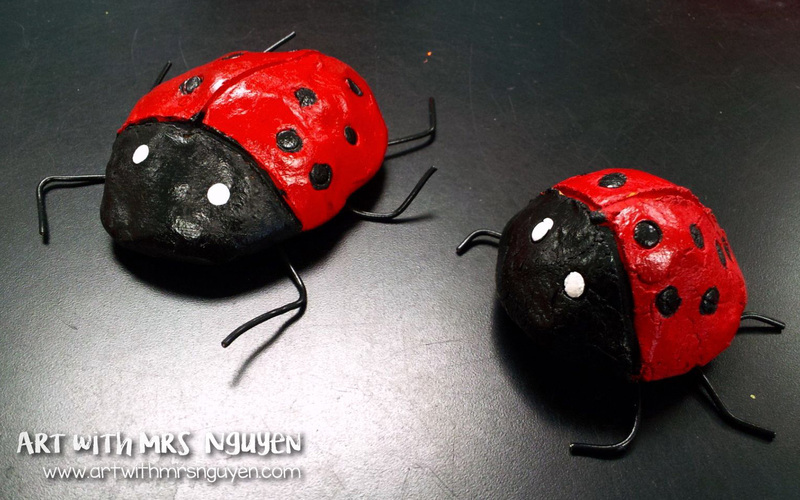 Once these were created, students flipped their pinch-pots upside-down to create the body for their ladybug. Using popsicle sticks, they drew a capital ‘T’ onto the back of their pinch-pot bodies (to divide the head and wings). 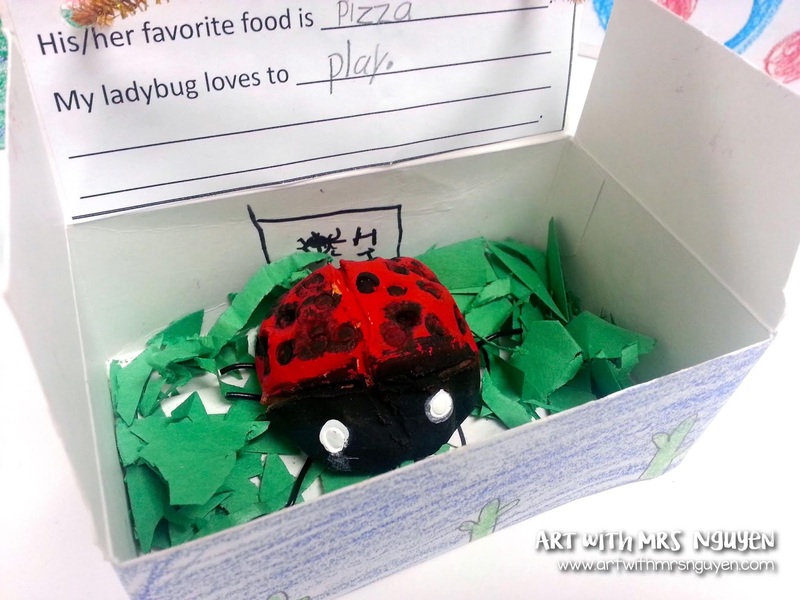 Then using a piece of a straw, they stamped circles onto their clay to create the eyes and spots on the wings. Finally, I had them write their initials on the inside of their pinch-pot ladybug bodies… and we put them up to dry out. 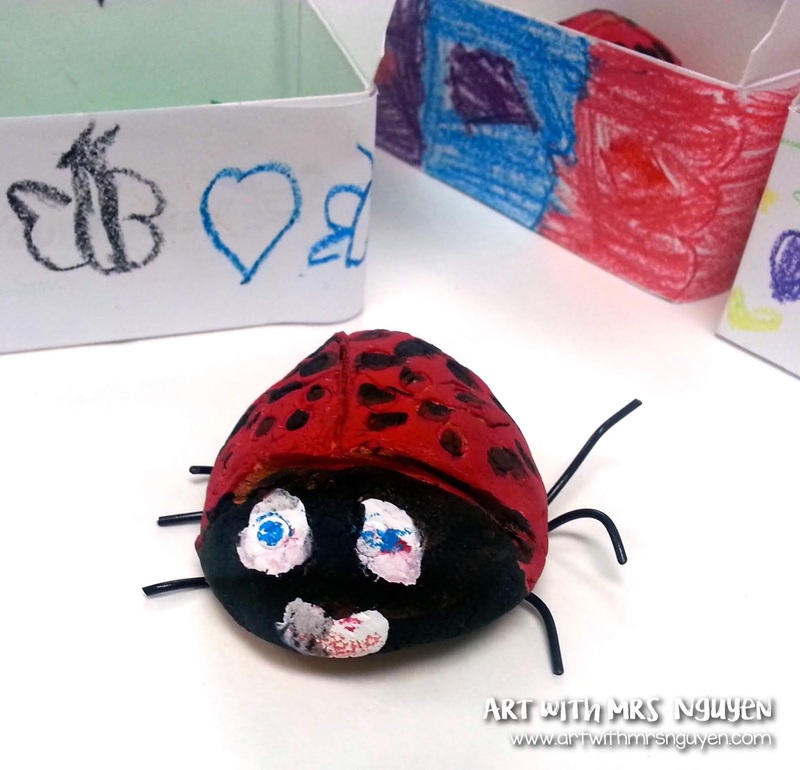 After being bisque fired, students used red, white, and black tempera paint to paint their ladybugs. 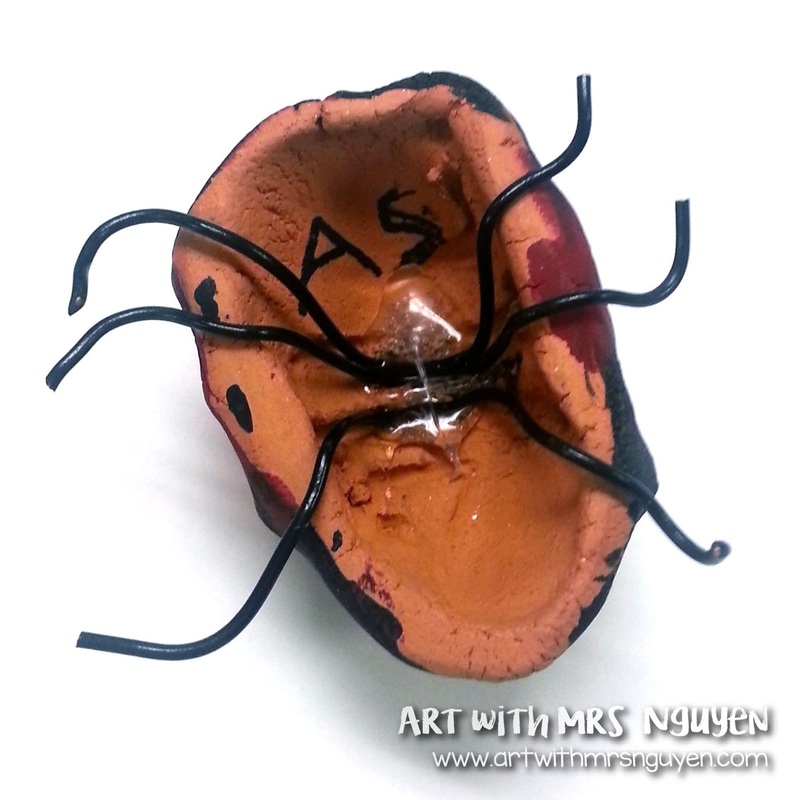 Then using cut up pieces of TwisteezWire, I helped students to hot glue ‘legs’ onto the underside of their pinch pots. 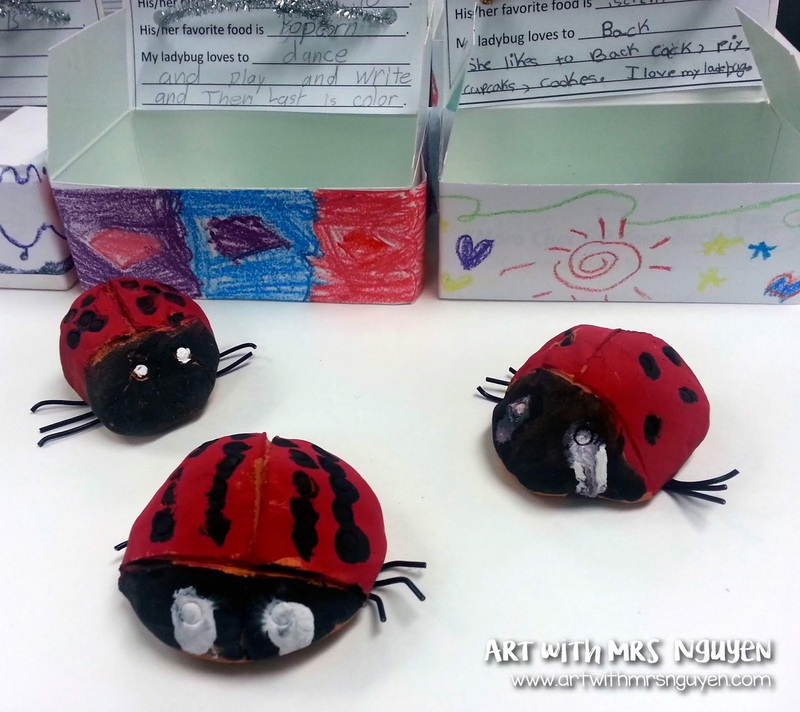 We could’ve ended the lesson there… but I wanted to expand it – so we created ‘pet boxes’ for our little clay ladybugs (a great way to ensure they weren’t dropped and broken on the floor as well)! I was recently emailed by a teacher in my district who had a ton of these little chicken nugget boxes and was looking to give them away – so of course I said I’d take some (not at all knowing what I’d do with them yet)! 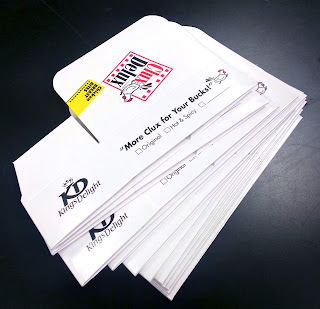 Each student got a box and decorated strips of paper cut down to fit the faces of the box (these papers were later glued down). I also printed out a little information form to be filled out and glued to the inside of the box. 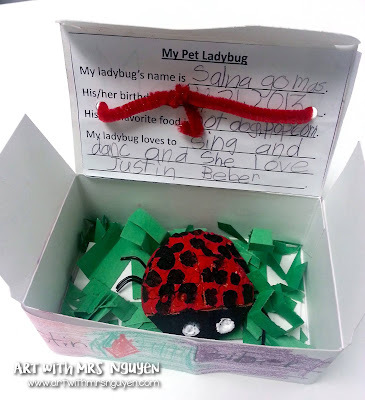 The form asked the name of the ladybug, the ladybugs birthdate, favorite food, and finally what the ladybug loves to do (I love all the cute responses I got from my first graders). Once everything was glued down, we used a hole-puncher to put two holes into the top lid of each box. Students then selected a pipe-cleaner and strung it through the holes to create a handle for their box. Scrap green paper was added to the inside of the box to create a bed of grass for the ladybugs. 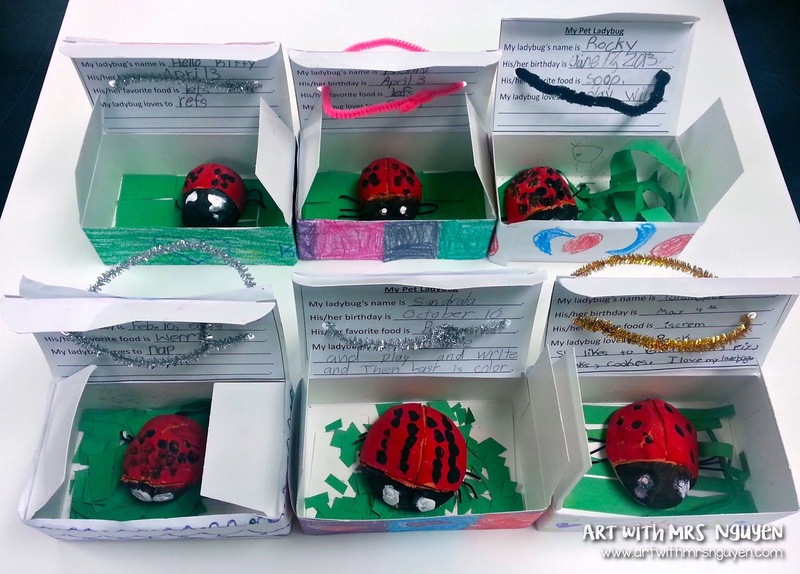 This might just be the cutest project I’ve ever done with a class -- like I literally want to keep every single one of these boxes!! The ladybug to the right likes to bake cakes, pies, cupcakes, and cookies. 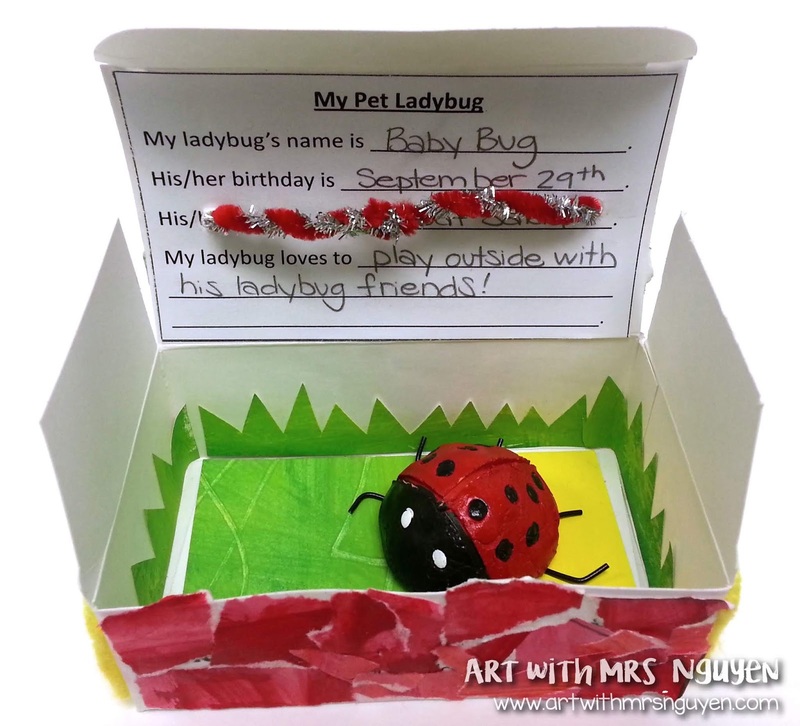 The lady bugs are really cute but I love the idea of putting them in the boxes even more. Those are precious and what a safe way to get them home. It always makes me sad to hear that one of my students broke their clay project going down the hall or getting on the bus, etc. I usually bag the kinder projects but now I'll be looking for a donation of those boxes! Kiln-safe wire!? That sounds awesome! haha I have so much TwisteezWire though - it's crazy! Suuuuuuuper cute! I've only seen kids make pinch pots to use as a little bowl. I love flipping it over to make a ladybug! (I'm still worried about using your/my kiln, though!